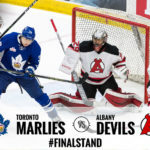 ALBANY, NY – Trailing by two goals in the third period, the Albany Devils fought back to force overtime and win in a shootout, 4-3, against the Toronto Marlies Saturday at Times Union Center. 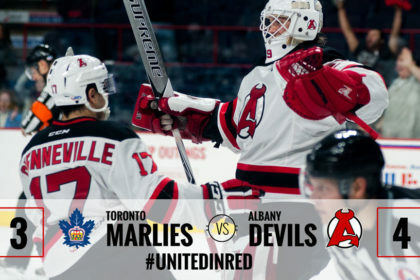 Albany came into the matchup hoping to split their weekend series against Toronto and thanks to John Quenneville’s lone shootout goal that’s exactly what happened. 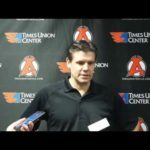 The Devils had trailed 3-1 early in the third until Quenneville found the upper-right corner at 3:23 for his team-leading fourth goal of the season. Seven minutes later, Ben Sexton tied the game picking a loose puck among a scramble in front at 10:27. 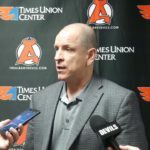 After both teams had man-up chances during overtime, Quenneville scored during the second round and Mackenzie Blackwood made all three saves. 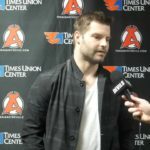 The win was Blackwood’s second of the season and first on home ice. He finished with 30 stops. There was late scoring from both sides in the first period. 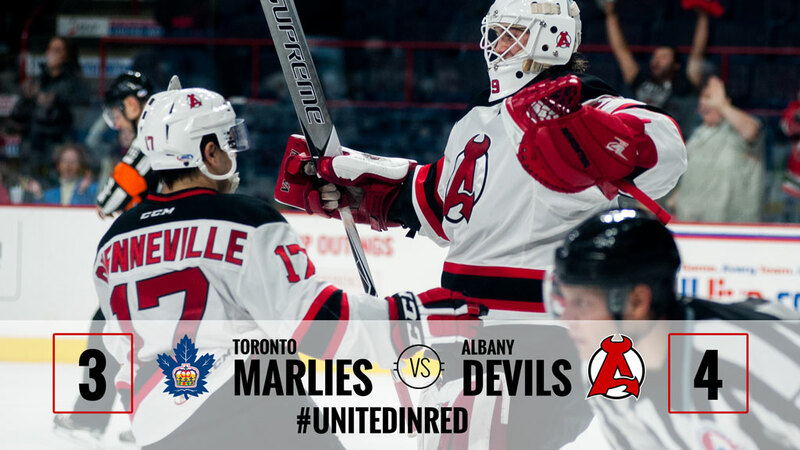 Andrew Nielsen got the Marlies on the board at 17:01, but the Devils responded quickly thanks to Reece Scarlett — his second of the season — with just 1:24 on the clock. 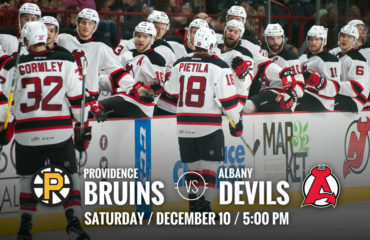 Scarlett received a pass from Andrew MacWilliam and put a slapshot from the top of the right circle past Antoine Bibeau. 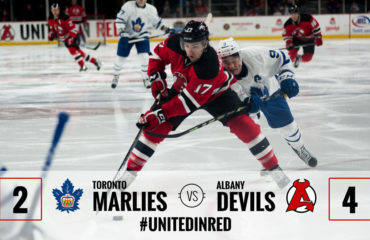 Bryon Froese and Trevor Moore gave Toronto a two goal lead with tallies at 4:25 and 12:19 of the second, setting the stage for Albany’s comeback. 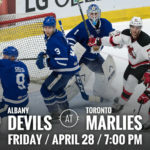 The victory ends the Devils two-game skid and improves them to 6-2-0-0, while the Marlies had their four-game winning streak snapped and move to 6-1-0-1. 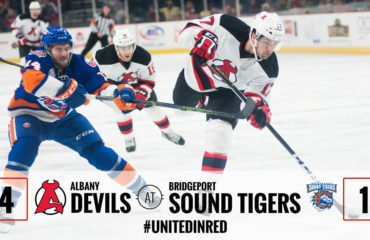 The Devils travel to face the Bridgeport Sound Tigers for their next game on Wednesday at 11 am.